Sorry for the lack of posts lately, I've been sick (still am, horrible fever). But I do have a treat for you! On my way to the doctor's office, I stopped at Nordstrom and picked up two bottles of MAC Bad Fairy, from the new Villainous Villains collection that hit stores today (was online on Tuesday). Now, this polish is already sold out online, and there's been some buzz online about it so it seems to be rather popular! The other two nail lacquers in this collection, Formidable! and Mean and Green are exact dupes of Orly Galaxy Girl and Space Cadet, respectively. I was eager to get Bad Fairy because I loved Space Cadet and Galaxy girl so much, (the foil like duochrome is quite stunning) and that seemed to be the unique one in the bunch. Bad Fairy is a magenta/orange duochrome, very sparkly. The closer you get to a light source, the more orange it appears, a rather lovely effect. My brush is kinda wonky though, there's one hair going in a completely weird directly, and the other hairs aren't as tightly bound as I like. For a $13 polish (the first polish I've paid over $10 for), I'm rather annoyed. I apologize that my pics aren't that great today, I let my cuticles go to crap since I've been sick. Indoors, close to light source. Told you my cuticles went to hell! Here's the best part, I bought one for me and one for you, one lucky reader! 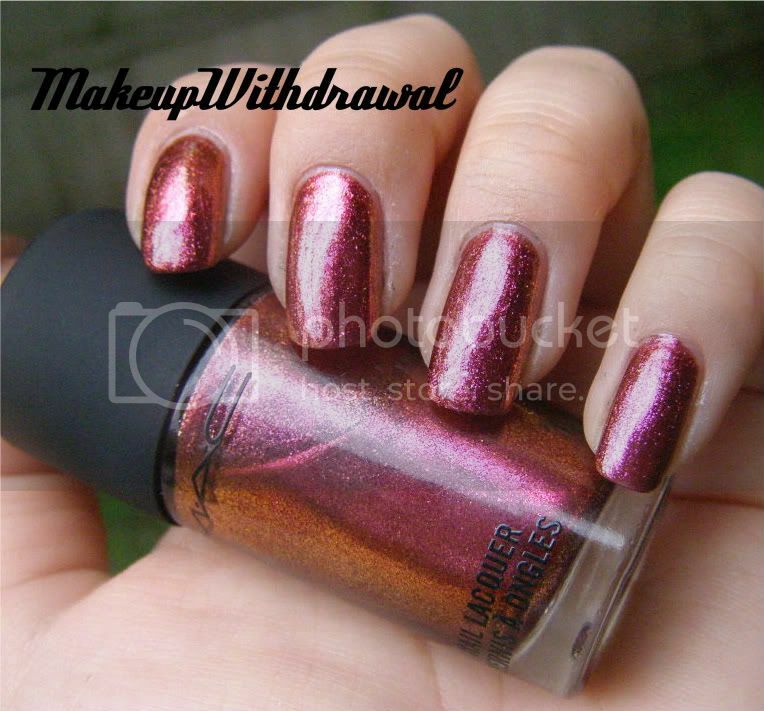 One lucky reader will receive a brand new MAC Bad Fairy lacquer. This contest is open to all readers, even international ones, ages 18 and over. Of the four Disney villains featured in MAC's Villainous Villain collection, which one is your favorite? Or do you prefer a villain that isn't featured? I myself wish that Jafar from Aladdin was featured, he always looked like he rimmed his eyes with kohl! 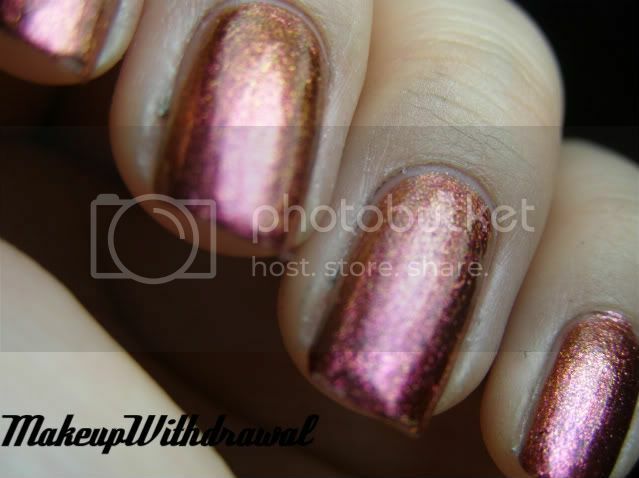 - Follow me on Twitter and retweet the following: "RT @MUWithdrawal- Enter to win MAC Bad Fairy Polish! http://bit.ly/d8XZ8K " Leave me a link to your tweet! This contest ends October 22nd, 10 PM EST. If after 3 days, the winner doesn't email me back, I'll redo the drawing (via Random.org).